Cabin Creekwood, the best of Virginia Cabin Rentals, is nestled in the mountains of Virginia near the Shenandoah Valley. Surrounded by nature and away from the hustle and bustle of the city, you can count on your stay with Cabin Creekwood being completely peaceful and relaxing. Even in the winter when the air is chilly and the leaves have all fallen, you can feel a sense of tranquility and inner quiet. Come visit us to see why our guests keep coming back to Cabin Creekwood. Our Virginia cabin rentals are located in Lyndhurst, Virginia, one mile from Sherando Lake and close to the George Washington and Jefferson National Forests. 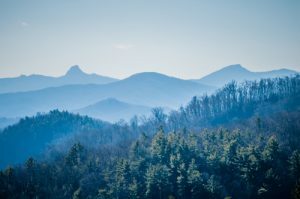 We are also located minutes from the Blue Ridge Parkway, an adventure in itself. Miles and miles of road wind in and out of the mountains providing beautiful views and lovely scenery. Wildlife is frequently scene, everything from deer to bears! You can also venture into the nearby towns for some great dining and shopping. If you are brave enough to venture into the cold, bundle up for the miles of hiking trails around our cabins. For the Holidays, spend time with your family roasting marshmallows and munching on smores around any of the outdoor fire pits at each of our cabins. Our accommodations all come with DVD players to enjoy a funny comedy with your family or snuggle up with your sweetheart and a bottle of wine for a classic romance. Whatever peace you are looking for, Cabin Creekwood guarantees you will find it. Any time of the year, any type of weather, we promise our Virginia cabin rentals will become your go to for whenever you need a getaway. Give us a call today and make your reservation at any of our lovely cabins. Visit us soon for your truly restful getaway.